00:48 | Prime Minister Prayut Chan-o-cha said that the peace process in Southern Thailand is progressing well. 01:39 | Prime Minister General Prayut Chan-o-cha said that he is confident that the decision to seek a Constitutional Court (CC) ruling on the draft Members of Parliament Law will not cause a delay in the election roadmap. He said the government must present the draft bill for royal endorsement by April 12. 02:54 | Government Spokesman, Lieutenant General Sansern Kaewkamnerd, said yesterday that the weekly Cabinet meeting had approved corruption eradication suggestions made by the National Council for Peace and Order (NCPO). The new guidelines require that an investigation begins within seven days after a complaint is filed and finishes within 30 days. 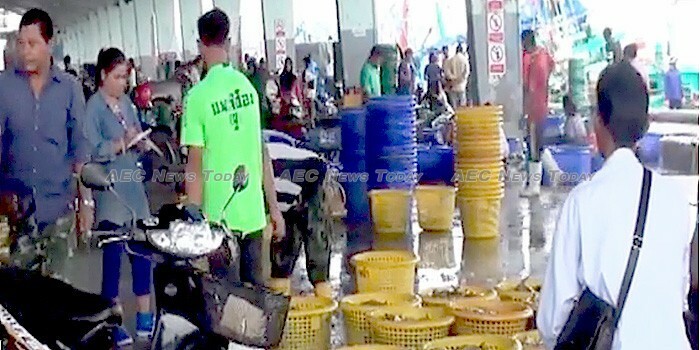 The Cabinet also approved draft legislation mandating that all workers in the Thailand fishing industry must be paid on a monthly basis, rather than an hourly or daily basis. The draft regulations also mandate that the rate paid to those in the fishing industry must not be lower than the country’s minimum daily wage. Salaries must be paid on any public holiday and through bank accounts. According to the Ministry of Labor (MoL) some 886,000 of 1.68 million migrant workers have so far completed the migrant worker registration process, with those not able to complete the document verification process by the March 31 deadline permitted to continue the registration process until June 30. 06:02 | A seminar has been held by the responsible subcommittee of the National Legislative Assembly (NLA) aimed at lifting the standards of Thailand herbal and cosmetic products to improve consumer safety. 06:58 | Royal Thai Police (RTP) Spokesperson Police General Weerachai Songmetta yesterday outlined the police strategy for safeguarding life and property during this year’s Songkran holiday. He said there will be specific focus on enforcing traffic laws, such as obeying traffic lights, using seatbelts and helmets, and not driving while drunk, drowsy, or while on the phone. 09:03 | Deputy director-general of the Livestock Development Department (LDD), Dr Jeerasak Pipattanapong-sophon, has warned farmers to be alert to animals in their care becoming ill due to the effects of hot weather and recent rain, warning that diseased animals which die must be buried or burnt and not consumed. Livestock officers have been deployed to give advice to farmers, collect samples from animals for testing, as well as to spray disinfectant. 10:08 | The National Research Council of Thailand (NRCT) will hold a competition aimed at promoting innovation in higher education between August 9-12 at the Thailand Research Expo 2018. The event will comprise seven difference categories — agriculture, food and health product, smart devices, education, culture and social,development, environment and energy, and security. 11:14 | Newsline today speaks with Lars Norling, CEO of Total Access Communication Public Company Limited (DTAC), on measures being taken to combat cyber bullying among young Thais. 17:10 | King Maha Vajiralongkorn Bodindradebayavarangkun will preside over the opening of a ceremony to celebrate the birthday of the Islamic prophet Mawlid al-Nabawi between May 14-16 in Bangkok. 17:55 | Foreign worker registration continues across Thailand as the clock ticks down to the March 31 deadline. At the one stop service centre in Chiang Rai province 3,000 foreign workers are yet to register, with some 14,000 already completing the process and being provided with the necessary documents allowing them to live and work in Thailand legally. 19:00 | Myanmar’s military has celebrated the 3rd ‘Armed Forces Day’ in the capital Naypyidaw with more than 10,000 troops participating in the parade.